on both food & drinks. Great Opportunity for lots of “B2B” Networking and tons of fun. Start some GREAT Relationships. Build your Contacts and your Business. 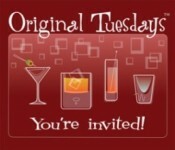 JOIN US at this month’s ORIGINAL Second Tuesday. and “PLAY IT FORWARD”. That’s what keeps this event successful! !